Going west towards Baltimore is where I found myself on Monday. Easy traffic this time of the year. Personal errands and lunch with my sister in law, Susie, who is always on target in finding restaurants around Baltimore that set themselves apart from the usual rest. 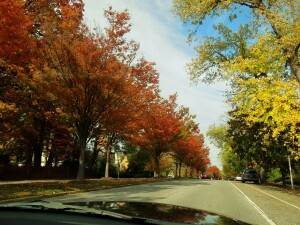 Driving down Roland Avenue was not as bad as some other roads in Baltimore. For years this city is always re-doing its roads. I am not kidding. The leaves on the trees have turned, already much more than at the beach. Susie was driving and off to Hampden we went. For the ones who do not know what Hampden is, well, it is one of Baltimore’s most distinctive neighborhoods. It is bordered by Roosevelt Park, Wyman Park, and the Jones Falls; lots of greenery. Originally, Hampden was a residential community for workers at the mills that were along the Jones Falls. Hampden is a neighborhood, at present, with lots of shops and eateries located in row houses along the streets. It is a colorful part of town, home to the annual “Hon Festival”, that term of endearment used by some parts of the city more than others. It is also home to “Miracle on 34th Street”, where homes on both sides of 34th street decorate their home with thousands of lights and Christmas decorations. Even some of their residents call it “Nightmare on 34th Street” because of the traffic turmoil caused at that time of the year. 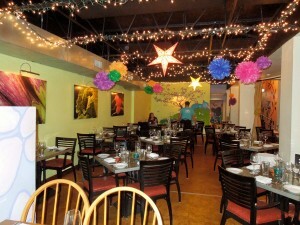 The Dogwood Restaurant is located at 911 W. 36th Street, Baltimore, MD 21211. It is in the Hampden neighborhood, between Elm & Roland Avenues. Tel. 410-889-0952. Website? 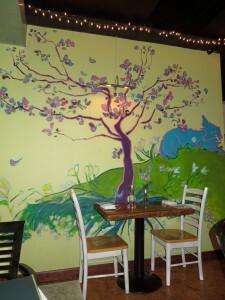 www.dogwoodbaltimore.com. This is a restaurant with a twist. It sets itself apart from the rest thanks to his Chef, Galen Sampson. “The Dogwood is a social business that trains a small group of individuals who are working to transition to a better way of life.” These individuals get intensive training in the culinary arts. By visiting The Dogwood you will be helping them to continue this service. You can read more about it on the above mentioned website. Susie and I arrived for a late lunch. There was parking in the back. You can enter the restaurant from the parking lot, as well. My first impression was great. Words that came to my mind were whimsical, bohemian, and certainly colorful. 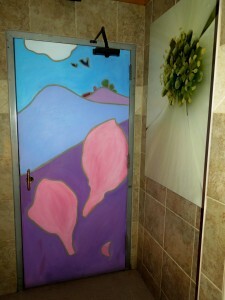 There were murals throughout the restaurant, including the bathrooms. The murals, I found out, were put there for a reason. 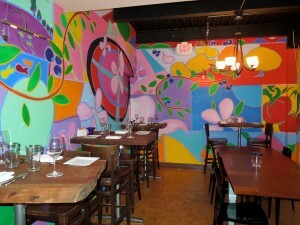 The Dogwood is a sustainable restaurant. The images highlight the dogwood tree and nature’s bounty. 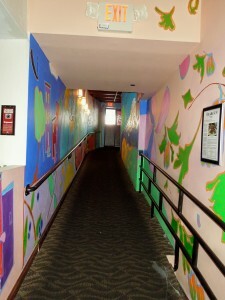 The murals were done with the help of Jay Wolf Schlossberg Cohen’s RAP project. The scenes were inspired by the community and finished by Jay. RAP means Rebuilding thru Art Project. It is “a West Baltimore initiative using community based public art as a catalyst for neighborhood residents to take control of their own community revitalization efforts”. For more info., please check http://www.rebuildingthruart.com. 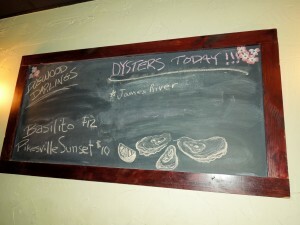 The restaurant has a full bar with a blackboard showing the specials of the day. Chris was our server and he knew his menu well. 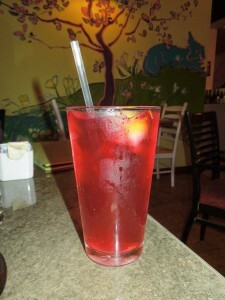 We first got an unsweetened iced tea that was beautiful and the color came from berries. Then, we ordered a side dish that caught my attention. Except we ordered it as an appetizer. 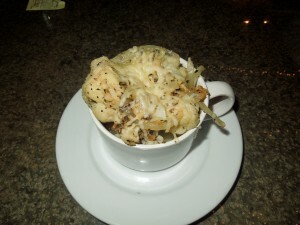 It was Tuscan-Style Roasted Cauliflower, roasted with sweet garlic, crusty bread anchovies and parmesan. Light and delicious with a well seasoned broth. The Dogwood has lunch sandwiches, where you can get one half sandwich, soup and salad. 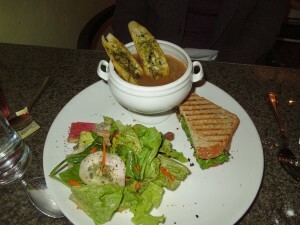 Therefore, Susie got the Grilled Chevre Sandwich with the Croque Monsieur Five Onion Soup, and salad. She thought is was so good, especially, when the onion soup was not overly salty. I went more vegetarian. Was in the mood. 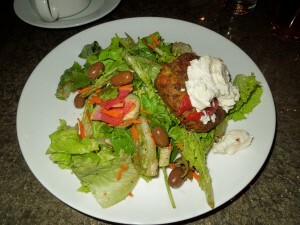 So mine was an Organic Lentil-Barley “Vegie Burger” on a Garden Salad. Organic lentils and barley with Moroccan spices, local chevre cheese and roasted red peppers, sauteed local squash and greens. The homemade burger had good texture and it really melted in your mouth. The chevre cheese accompanied with a bite here or there of the roasted peppers definitely got your taste buds working. The restaurant is known for its wines. The Chef has tasted every single one. That’s what Chris told me. 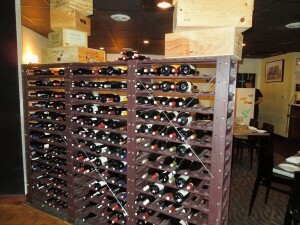 It has won the 2011 Award of Excellence for its Wine List from Wine Spectator. Among the awards this restaurant and its Chef have received, there is one that was given by CNN in 2008, called CNN Hero. The award was given for his job training program that helps people who have been in prison, homeless or fighting addiction. Every dish is cooked to order. Any food allergy concerns? Please tell your server and they will be able to adjust your food. On the calendar? Cooking Classes. Nov. 12th – Cooking with the Seasons – The traditions of the American Thanksgiving. December 10th – The Healthy Chef – Delicious Holidays. 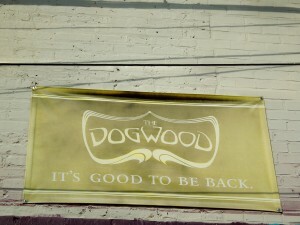 The Dogwood opens Mondays through Saturdays from 11:30 – 3:00 p.m. for lunch. For Dinner? Mondays through Thursdays from 5:00 – 10:00 p.m. for dinner. 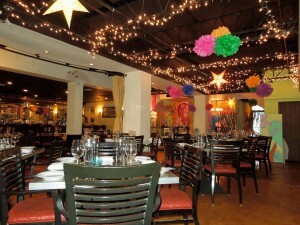 Fridays and Saturdays from 5:00 p.m. – 11:00 p.m. for dinner. It is closed on Sundays. The dinner menu is different from the lunch menu and my mouth was watering as I was reading it. Check it out on the website above mentioned. Have a great day! !…Talk to you later. Yoga – a discipline that originated in ancient India whose goal is the attainment of a state of perfect spiritual insight. 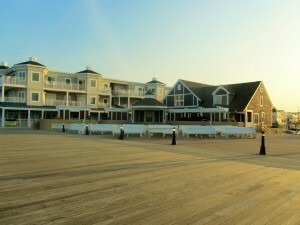 You can experience Yoga at Sunrise in Bethany Beach all the way through Labor Day Week-End. When and Where? 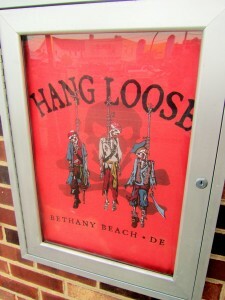 At the Bethany Beach Bandstand on Fridays, Saturdays, Sundays and Mondays at 6 a.m. until 7 a.m. There is a drop in fee of $5. Limited mats are available so if you have one please bring it with you. Since it is held outdoors, the class will be held weather permitting. For more info., please call 302-537-7838 or visit www.bethanybeachyoga.org. Tai-Chi – Also called Meditation in Motion. Is a non-competitive, self paced system of gentle physical exercises and stretchings, that help promote good health and well being. It reduces the stress of today’s busy lifestyles. Where and When? Bethany Beach Bandstand on Mondays, Wednesdays, Fridays and Saturdays, all the way through Labor Day. 7:30 a.m. until 8:30 a.m. Weather permitting. $5 drop in fee. Need more info? Please call Jim Mace at 302-363-4509. 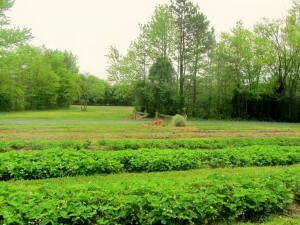 West of Bethany Beach (4.8 miles) in Clarksville, Delaware – Good Earth Market and Organic Farm will be hosting a “Farm to Table” feast to benefit Children & Families First, Sussex County. Date: Tuesday, June 7th. It will be a dining experience as the sun sets; a table outside on the farm. Locally grown ingredients will be prepared by Plate Catering; paired with perfect wines. The event begins at 6:00 p.m. and the cost is $95 per person. 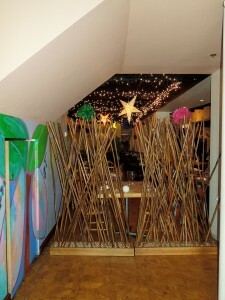 Call 302-537-7100 for a reservation. Rain date will be the following day. 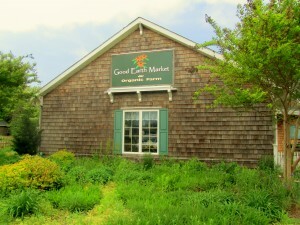 Good Earth Market is located at 31806 Good Erth Lane, Rt. 26, Clarksville, DE 19970. Website is www.goodearthmarket.com. I wrote a post with pictures on Good Earth on May 4th. If you would like to check it out, just click on the month of May, 2011 and scroll down to the date. Saturday, 6/11 – At Good Earth Market, Clarksville, Delaware there will be a cooking demonstration. At Noon. One of Matt Haley’s Sodel chefs will be the featured chef. Come and find out for yourself. Have a good one!! Talk to you later….